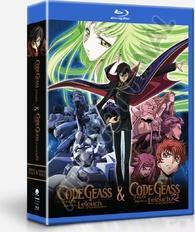 Code Geass the Complete Series contains anime episodes 1-25 of Season 1 Lelouch of the Rebellion and episodes 1-25 of Lelouch of the Rebellion R2. The year is 2017 of the Imperial calendar and parts of the world are uner the control of the Holy Britannian Empire. Lelouch Lamperouge, an exiled Britannian prince, encounters a strange girl known as C.C., who gifts him with a great and terrible power. The Geass. With this powerful ability, Lelouch can get anyone to do as he wills. But the power of Geass: is it a blessing…or a curse?